You experience visual distortions and hallucinations. You experience manipulation of will, emotions, feelings, and perceptions. You experience reading thoughts remotely, retrieving memories, implanting personalities. You experience debilitating mental acuity: inability to concentrate, disruption of ability to think rationally and independently. You experience loss of memory and knowledge. You experience Inadequate states, which targeted individuals have never experienced before (states of narcotic intoxication, depression, obsessive desires and so on). You experience burning sensations on your skin or internal organs. – Excruciating, artificial pain in any part of the body, including heart attacks and other serious, medical conditions. You continually have difficulty sleeping. – Control of sleep patterns: sleep deprivation or uncontrollable sleep. You experience forced speech. – Manipulation of human behavior: forced speech, involuntary body movements, transmission of specific commands into the subconscious, compulsory execution of these commands. You hearing intense loud sound or electronic-sounding noise, often mistaken for tinnitus (microwave hearing). You hearing voices that sounds like chanting while an electrical machine is on (radio, fridge, electric fan, air conditioning, air vent). You hearing voices that sounds like chanting while water is running in sink, toilet bowl, faucet or shower. You experience Induced dreams – The induced dreams, incidentally, are also easy to obstruct. The activity occurs when you have reached the REM (rapid-eye movement) stage of sleep. Your brain, at that stage, is entrained by ELF, which deepens your sleep, thus eliminating the prospect of your being cognizant of the quasi subliminal auditory input being pumped into the back of your skull by bone-conducted means. The quasi-subliminal auditory input is what influences the course of your dreams. 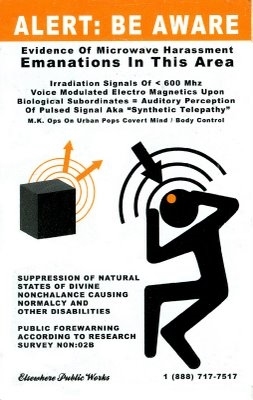 In a semi-conscious state, you can physically recognize this attempted input as resembling short-burst transmissions which, when impacting upon the back of your skull, create a hissing sound, rather like “PF-FFT! …PF-FFT!” at five-second intervals. This can be blocked. All that is required is that you protect the back of your skull with the aforementioned materials before you fall asleep. Document everything! This will do two things. It will make the stalkers more careful and maybe your life easier. And it will provide a record in the event of legal action. Get a camera if you don’t have one and start taking pictures or videos. Write a blog or daily journal. Write down the daily harassments. It will help you organize your thoughts and would provide easy access to a record when talking to government officials or lawyers who may be able to help you. 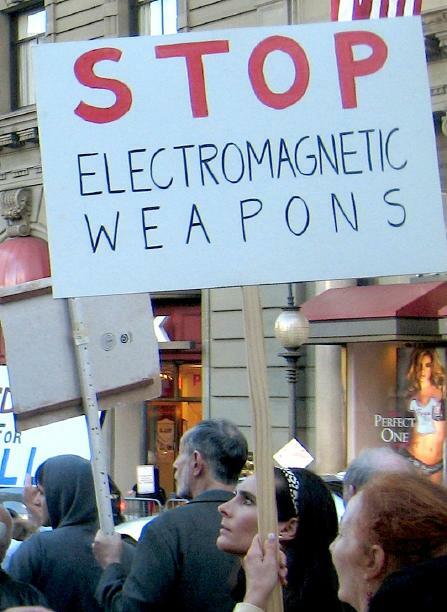 Electronic harassments normally involves various types of directed energy weapons. These weapons normally requires the operations of someone and must be located near the location of a TI. You should be aware of your surroundings and possible source of the electronic harassments. Write down all the symptoms you experience while under electronic harassments. The most common are: muscles and joint pains, nausea, skin burning, disorientation, itching, pin pricks, etc. If possible, shielding from the source of electronic attacks is extremely important, If not possible, alleviate all the symptoms by taking smart steps by wearing right clothes, eat properly, exercise, be active. John Mecca’s website, www.us-government-torture.com, has lots of good information about this topic that has been helpful to many people. Try to gather enough information to adapt to your specific situations. Try to bring this crime into public awareness via networking. It is important to do networking as TIs have little recourse and no proven and effective countermeasures at the moment. Victims commit suicide due to the extreme trauma of the experience, and supporting one another will help others to avoid this tragic outcome. Move in with other people if at all possible. Even though you value your independence, the attacks are considerably more effective when you’re living on your own. Isolation is important to the perpetrator’s agenda. Stay in contact with others who are in the same situation. This can be done using email, visiting websites and reading victims’ accounts or joining a forum where people talk about their experiences and support one another. Refrain from telling too many people what is happening. People will not believe you and you stand the risk of being committed by well-meaning family members. However, if you are suicidal, and have no place to go and no one you trust, we would strongly advise that you allow yourself to be taken care of in a hospital rather than let the thoughts of self-harm overtake you. It is only temporary and you will be released. Never think of it as something too horrible to contemplate – suicide is the horrible choice, far worse than going to a hospital for a while. By talking to other victims, and letting them know what is happening to you, you can be assured you will never need to feel alone. Develop a solution-oriented mind-set. That is, find solutions to problems wherever possible. See the countermeasures page for some solutions. Work hard at overcoming and facing your fears. The attacks are more effective when you are afraid. Remember that we’re all in this together and resist the urge to isolate yourself if something upsets you. Find someone who believes you who you can talk to about this. Other victims are a good choice, but some may be too unstable to talk to. Choose someone who seems to be in control. We are all at different stages of dealing with this. Ignore the attacks. In time, many of them DO stop. But if you’re panicking, they tend to increase the attack, so it is imperative to gain control within and stay calm. (We’re speaking from experience here – many of us have seen this pattern – so don’t lose hope!) Conversely, don’t expect perfection from yourself. This takes time. My panic sessions diminished over time, rather than stopping all at once. Take a good multivitamin and a vitamin B complex for stress. See countermeasures for more detailed suggestions. Try to be flexible as much as possible. Bend with the wind rather than try to fight it. If you are being bothered by noise don’t just sit there and let it get to you. Do something else, like reading a book, watching TV, going online or going outside for a walk. Listen to music to counteract the high frequency sound (and for enjoyment!). Do something you love to do. Creative activities are especially beneficial (don’t think too hard – just do something). This raises serotonin levels and helps you deal with the stress.